C-Line 46912 shop ticket holders are strong and rigid. Clear vinyl holders for a clear view of your document. Metal eyelet at top for hanging. Reinforced stitched shop ticket holder. 9" x 12" and open on the 9" side with metal eyelet for hanging. 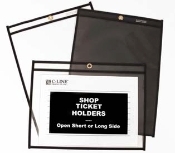 Plastic ticket holder withstands the daily use of the shop environment to provide a long lasting job ticket holder.Job Ticket holders. Reinforced taped and stitched edges add rigidity and stand up to heavy use in tough work environments - perfect for use in manufacturing, inventory control, or any environment where paper work may be posted or annotated. C line Job ticket holders Pages lift out easily allowing quick access to documents. Strong rigid vinyl job ticket holders available in bulk. Line shop ticket holders.